We made our way back to Cadillac Mountain before sunset, hoping to get above the fog that was rolling in over Mount Desert Island. The sun appeared at just the right time. 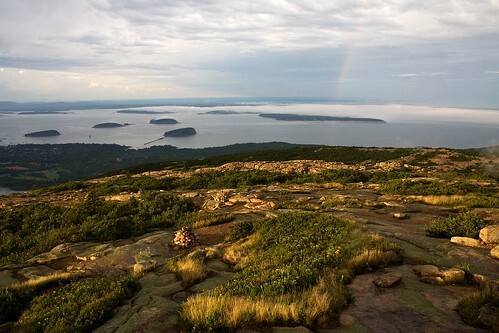 Light streamed through a break in the clouds and illuminated the granite on the summit of Cadillac Mountain. It also treated us to a display of multiple rainbows. This entry was posted on January 2, 2009 at 10:32 am and filed under Acadia, Acadia National Park, Atlantic Ocean, Bar Harbor, Cadillac Mountain, fog, Frenchman Bay, Maine, Mount Desert Island, mountain, National Park, ocean, rainbow, sunset, vacation, water.